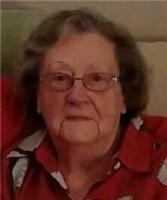 Agnes E. Cooper, 84, resident of Medina, formerly of Chardon, passed away on Monday, November 24, 2014. She was born on August 25, 1930 in Lonaconing, Maryland to Raymond and Mary (nee Foote) Metz. Agnes married William E. Cooper on June 20, 1949; he preceded her in death in December 1998. Agnes was employed with Westinghouse for 18 years. Her greatest joy was spending time with her family. Her surviving family incl; daughter Billie Jane (Larry) Gardner, son William R. (Wendy) Cooper, grandchildren; Katie (Robert) Chapman, Emily, Amy Cooper, great-grandchildren; Makena and Morgan Chapman, and a special "Grandma Cooper" to Larry Jr. (Julie) Gardner, Nick (Josie) Gardner, Brenda Arnold, Lance, Darren, Job, and Jackson Gardner, Trent Arnold, her brother Raymond Metz and sister Janet (Edward) Mills, also to include many nieces and nephews. Visitation for family and friends will be held Saturday, November 29, 2014 from 12 Noon to 4 p.m. at Carlson Funeral Homes & Cremation Services. Funeral Service will follow at 4 p.m. Private Burial on Monday in Western Reserve Memorial Gardens, Chesterland, Ohio. In lieu of flowers contributions may be directed to the Medina County Hospice, 5075 Windfall Road, Medina, Ohio 44256. Please share your memories of Agnes.